This article is about the Atlantic hurricane of 2007. For other storms of the same name, see List of tropical storms named Dean. Hurricane Dean was the strongest tropical cyclone of the 2007 Atlantic hurricane season. It was the most intense North Atlantic hurricane since Hurricane Wilma of 2005, tying for seventh overall. Additionally, it made the third most intense Atlantic hurricane landfall. A Cape Verde hurricane that formed on August 13, 2007, Dean took a west-northwest path from the eastern Atlantic Ocean through the Saint Lucia Channel and into the Caribbean. It strengthened into a major hurricane,[nb 1] reaching Category 5 status on the Saffir–Simpson hurricane wind scale before passing just south of Jamaica on August 20. The storm made landfall on the Yucatán Peninsula on August 21 as a powerful Category 5 storm. It crossed the peninsula and emerged into the Bay of Campeche weakened, but still remained a hurricane. It strengthened briefly before making a second landfall near Tecolutla in the Mexican state of Veracruz on August 22. Dean drifted to the northwest, weakening into a remnant low which dissipated uneventfully over the southwestern United States. Dean was the second-most intense tropical cyclone worldwide of 2007 in terms of pressure, only behind Cyclone George in the Australian region, and tied with Felix as the most intense worldwide in terms of 1-minute sustained winds. The hurricane's intense winds, waves, rains and storm surge were responsible for at least 45 deaths across ten countries and caused estimated damages of US$1.66 billion. First impacting the islands of the Lesser Antilles, Dean's path through the Caribbean devastated agricultural crops, particularly those of Martinique and Jamaica. Upon reaching Mexico, Hurricane Dean was a Category 5 storm, but it missed major population centers and its exceptional Category 5 strength landfall caused no deaths and less damage than in the Caribbean islands it passed as a Category 2 storm. Through the affected regions, clean up and repair took months to complete. Donations solicited by international aid organizations joined national funds in clearing roads, rebuilding houses, and replanting destroyed crops. In Jamaica, where the damage was worst, banana production did not return to pre-storm levels for over a year. Mexico's tourist industry, too, took almost a year to rebuild its damaged cruise ship infrastructure. Dean was the first hurricane to make landfall in the Atlantic basin at Category 5 intensity since Hurricane Andrew on August 24, 1992. Dean's Category 5 landfall was in a sparsely populated area and thus far less damaging than Andrew's, even though Dean was much larger, but its long swath of damage resulted in its name retirement from the World Meteorological Organization's Atlantic hurricane naming lists. On August 11, 2007, a tropical wave moved off the west coast of Africa, and, encountering favorable conditions, quickly developed into Tropical Depression Four, about 520 miles (835 km) west-southwest of Cape Verde on August 13. The depression moved briskly westward, and was upgraded to Tropical Storm Dean at 1500 UTC on August 14. The storm's intensity continued to build although dry air and cooler air inflow from the north were slowing structural development. Ragged bands formed on August 15 and the formation of a partial eyewall was observed later that day. Intensification continued, and the storm was upgraded to Hurricane Dean at 5 am EDT (0900 UTC) August 16. The deep-layered ridge to the north continued to steer the system west, towards the Caribbean Sea. The storm quickly strengthened to a Category 2 hurricane on the Saffir–Simpson Hurricane Scale. The storm's development slowed slightly but a reconnaissance aircraft discovered a closed eyewall on August 17 as the storm passed through the Lesser Antilles. Data from the aircraft indicated that Hurricane Dean had strengthened to a Category 3 hurricane and its trailing bands were still over the Lesser Antilles. During the evening of August 17, Dean strengthened into a Category 4 hurricane and continued to steadily grow in both size and intensity through the night. On August 18 the presence of a double eyewall was noted, indicating an eyewall replacement cycle and causing short term fluctuations in intensity. These fluctuations did not affect the storm's well defined satellite presentation. Operationally, Dean was thought to have only been a Category 4 on the 18th, but post-storm analysis shows that Dean had become a 165 miles per hour (265 km/h) Category 5 on that day. Dean weakened very slightly on the morning of August 19 as it finished the eyewall replacement cycle and began to interact with the island of Jamaica. Hurricane Dean passed south of Jamaica on the evening of August 19 and began to intensify again that night. Its eyewall replacement cycle was thought to be completed. A concentric eyewall was briefly observed again on the morning of August 20, but did not last long. The hurricane, still tracking west-northwest under the influence of a strengthening deep-layered high pressure system to the north, moved over waters with extremely high heat content and began to strengthen once again. The eyewall became even better defined during the day, and, at 8:35 pm AST on August 20 (0035 August 21, UTC), Dean restrengthened to a Category 5 hurricane, the highest rating on the Saffir–Simpson Hurricane Scale. It made landfall as a Category 5 storm in Quintana Roo's Costa Maya region, 40 mi (65 km) northeast of the border between Mexico and Belize, and weakened on its way over land, reemerging on the western side of Yucatán as a Category 1 storm. Dean regained strength as it crossed the Gulf of Mexico, and made its second landfall as a Category 2 storm on August 22, at around 11:30 CDT, near Tecolutla, Veracruz, to the south of Tuxpan, where after it moved westward, losing strength and disintegrating over central Mexico. A small remnant circulation reached the Pacific Ocean, eventually moving northwestward around an anticyclone, roughly parallel to the Mexican coast and finally back inland over the southwestern United States, where it completely dissipated on August 27. Hurricane Dean's smooth and well-predicted track gave unusually advance warning to all of the nations in its path and allowed them time to prepare for the storm's impact. Because of the advance warning and Dean's extraordinary strength, the nations of Central America and the Caribbean set up hundreds of shelters, readied thousands of disaster recovery experts, evacuated hundreds of thousands of vulnerable residents, and prepared millions of dollars of emergency supplies. As Hurricane Dean approached the Lesser Antilles the local meteorological services issued watches and warnings, advising residents to prepare for the storm. Hurricane warnings were issued for St. Lucia, Dominica, Martinique and Guadeloupe and its dependencies. Hurricane watches were issued for Saba and St. Eustatius. Tropical storm warnings were issued for Barbados, Antigua, Barbuda, St. Kitts, Nevis, and St. Maarten St. Vincent and the Grenadines, the U.S. Virgin Islands, and the British Virgin Islands. Tropical storm watches were issued for Sint Maarten, St. Vincent, Grenada and its dependencies, Montserrat, and Anguilla. Local authorities closed airports, set up shelters, and readied emergency service personnel. Authorities in Martinique canceled a memorial to the victims of West Caribbean Airways Flight 708 and began to set up shelters. In Dominica, tourists were evacuated to concrete shelters and the vast majority of foreign medical students from the Ross University School of Medicine evacuated the island. The government of Dominica also canceled leave for emergency service personnel and evacuated Princess Margret Hospital, fearing that its roof might be vulnerable to the storm's winds. Martinique's main airport and both of St. Lucia's commercial airports closed when the last airplanes landed on the night of August 16 and the storm's outer rainbands began to sweep over the island. In anticipation of Dean's significant damage, several emergency response groups gathered funds and readied personnel. On August 14 the Caribbean Disaster Emergency Response Agency (CDERA) placed its Regional Response Mechanism on standby and contacted the National Disaster Coordinators of all member states in the Lesser Antilles. On August 15 the U.S. Agency for International Development (USAID) dispatched teams to Barbados, Dominica, and St. Kitts in advance of the hurricane to provide damage assessment should the hurricane affect those islands. The Eastern Caribbean Donor Group convened a meeting on August 16 under the Chair of the Resident Representative United Nations Development Programme Barbados in anticipation that member states would require international assistance. Hurricane warnings were issued for all of Jamaica, for Haiti from Port-au-Prince to the Dominican border, and for the Dominican Republic from Barahona to the Haitian border. Tropical Storm warnings were issued for the rest of Hispaniola and for coastal Cuba between Camagüey and Guantánamo. Hundreds of thousands were evacuated from vulnerable low-lying and coastal areas and disaster management programs were activated throughout the Greater Antilles. Jamaica, which was forecast to bear the brunt of Hurricane Dean, underwent the most extensive preparations. The Jamaican government executed long-standing evacuation plans, including converting the country's national arena into a shelter and relocating inmates from two maximum security prisons. Political parties in the island suspended their campaigning for the August 27 national elections, to allow residents to prepare for the storm. Curfews were put in place for parts of the island, while off-duty essential personnel were called back to work. More than 1,000 schools and churches were converted to emergency shelters, but residents only occupied 47 of them before the storm's arrival. Evidently the country's high crime rate led islanders to fear for their belongings should they abandon their homes. UNICEF prepared 4 emergency health kits and 1,000 water containers and Copa Airlines agreed to fly the supplies to Jamaica on its scheduled August 22 flight, if possible. The World Food Program prepared food stocks in nearby Haiti, ready to move them to Jamaica if they were needed. The United Nations Disaster Assessment and Coordination (UNDAC) team tried to reach Jamaica, but only one member arrived before all incoming flights were canceled. The United States confirmed that it would offer aid if it was needed, and the North-West Caribbean Donor Group met to decide what actions would need to be taken. HMS Portland followed Dean through the Caribbean, prepared to support damaged islands if necessary. The island of Hispaniola was also predicted to be heavily affected by the storm. Workers from World Vision supplied food, clean water, medicines and emergency generators in the southern provinces of the Dominican Republic, and in the southern departments of Haiti where hurricane warnings had been issued. In low-lying areas, 1,580 residents of the Dominican Republic and more than 1,000 Haitians were evacuated as the storm approached. Small craft were advised to stay in port, while Haiti's Toussaint Louverture International Airport was closed. The Cayman Islands were expected to suffer badly if Hurricane Dean passed too close, and mandatory evacuations were instigated for the low-lying Little Cayman. Tourists were forbidden from entering the island and extra flights were added to evacuate those that were already there. Schools and civic centers were converted to shelters on Grand Cayman and Cayman Brac, and, despite the mandatory evacuation, one shelter was opened on Little Cayman for the residents who remained there. Expecting catastrophic damage, two Royal Navy ships of the Atlantic Patrol Task (North), HMS Portland and RFA Wave Ruler, followed 150 mi (240 km) behind the storm in order to arrive at Cayman as soon after the hurricane as possible. Cuba and Puerto Rico, neither of which were expected to experience the worst of Dean's strength, prepared more modestly. Cuba's Civil Defense evacuated 350,000 people from the coastal provinces. The government in Havana suspended all tourist programs ahead of the storm. Soldiers and emergency officials were prepared to convert schools and other government buildings into temporary shelters, but stood down when it became evident that they would not needed. The U.S. Federal Emergency Management Agency (FEMA) deployed a five-member team to Puerto Rico ahead of Hurricane Dean. They were equipped with satellite communication systems to provide video-teleconferencing and help make real-time assessments of any damage. With Hurricane Dean's path predicted well in advance of the storm, the Government of Mexico was able to make ample preparations. On August 17, a state of emergency was declared for the state of Quintana Roo where Dean was expected to make landfall. On August 18 authorities began evacuating tourists and those residents living in the most vulnerable parts of Quintana Roo. The state government set up storm shelters in schools and other public buildings. With emergency supplies at the ready, the state of Yucatán, Quintana Roo's neighbour to the northwest, declared a green alert. On August 19 a hurricane watch was issued on the Yucatán Peninsula from Chetumal to San Felipe and residents made their last-minute preparations. A hurricane warning was issued for the coastal locations north of Belize City with the forecast of 150 mph (240 km/h) winds. The government instituted a dusk-to-dawn curfew from Belize City to the Mexican border. On August 16 and 17, Prime Minister Said Musa chaired two meetings of Belize's National Emergency Management Organization (NEMO). He instructed the newly created Coastguard to evacuate popular tourist sites Caye Caulker and Ambergris Caye by boat and plane. Authorities also evacuated Belize City's three hospitals, moving high-risk patients inland to the capital Belmopan. The mayor urged residents to leave Belize City and to make use of shelters in the capital. The United Nations Disaster Assessment and Coordination team dispatched two members to Belize City and the rest of the team traveled to Belmopan. Government supplies were stored in Orange Walk, Corozal ready for post-storm relief. Essential equipment from the Red Cross and the Pan American Health Organization was stored in the elevated UNICEF building and the Belize City UN building was converted to a crisis center. 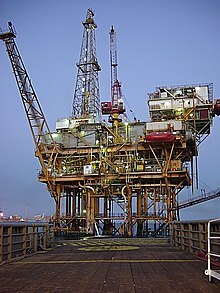 Hundreds of oil platforms, such as this one in the Gulf of Mexico, were evacuated in anticipation of Hurricane Dean. Oil futures spiked on August 15 as analysts considered the impact of Hurricane Dean on refining capacity if it were to move into the Caribbean as predicted. Transocean evacuated 11 nonessential workers late on August 15 from an oil rig located about 160 mi (260 km) southeast of New Orleans. The company left about 125 personnel on board the structure. A day later, Royal Dutch Shell evacuated 275 ancillary staff, following an evacuation of 188 due to Tropical Storm Erin. On August 18, 2007, 10,300 barrels (1,640 m3) of oil and 11 million cubic feet (310,000 m³) of natural gas were shut-in per day, accounting for 0.8% of crude production in the Gulf of Mexico. By 11:30 am CST (1630 UTC), two rigs and one platform evacuated personnel. Pemex, the state-owned Mexican oil company, made preparations to shut down oil production on August 19 ahead of Dean. It evacuated 13,360 workers from more than 140 oil platforms, using 55 boats and 29 helicopters. As the storm continued to intensify, the number of evacuated Pemex workers increased to 18,000 on August 20, and all 407 wells and drilling operations were abandoned. This reduced the worldwide production of oil and natural gas by 2.65 million barrels (421,000 m3) and 2.6 billion cubic feet (74,000,000 m3) per day, respectively. Throughout the Caribbean Sea, about a dozen cruise ships altered their routes to avoid Hurricane Dean. Honduras was put on a state of preventative alert for 48 hours, particularly the departments to the north of the country; the Bay Islands were on a state of red alert. There were places ready to accommodate 10,000 people for 15 days if necessary. In the United States, the Louisiana Governor's Office of Homeland Security and Emergency Preparedness activated its Crisis Action Team on August 16 to monitor the storm and coordinate preparation. Governor of Louisiana Kathleen Blanco declared a state of emergency early on the evening of August 17, asking for a presidential emergency declaration to give Louisiana access to federal funds prior to any landfall. Texas Governor Rick Perry declared Dean to be an imminent threat to the state, and thus initiated a full-scale hurricane preparedness effort on August 17 when the storm was at least five days away. Prior to the storm, Texas suffered severe flooding from several June–July storms, and Tropical Storm Erin left the ground still saturated. Governor Perry feared that more rainfall from Dean would cause additional flash flooding, and had 250 Texas Parks and Wildlife Department crews on standby with boats to assist in potential evacuations. He was willing to deploy up to 10,000 Texas Military Forces soldiers, and did deploy several elements of the Texas State Guard who set up emergency shelters. The Texas fuel industry began surging fuel loads to coastal counties to ensure adequate fuel in the event of the hurricane causing a disruption to the fuel distribution system. In anticipation of evacuations, the Texas Department of Transportation began working on extra evacuation lanes and contraflow. NASA cut short the STS-118 mission as a precaution, in case Dean approached Mission Control at the Lyndon B. Johnson Space Center in Houston. To that effect, mission managers cut the mission's final spacewalk short by two hours, allowing them to land a day earlier than originally planned. Because of differing sources, totals may not match. Fifteen countries felt the effects of Hurricane Dean as its path through the Caribbean Sea claimed 42 lives. The hurricane first brushed the Lesser Antilles on August 17, 2007, and as it passed through the interior of the Caribbean its outer rain bands swept over the Greater Antilles. It passed Jamaica as a Category 4 hurricane, and strengthened to a Category 5 storm as it made landfall on Mexico's Yucatán Peninsula on August 21. A second landfall on August 22 was less devastating. Hurricane Dean entered the Caribbean as a Category 2 hurricane through the Saint Lucia Channel on August 17. It moved briskly between the Lesser Antillean islands of St. Lucia and Martinique, with its storm surge and rain bands reaching every island in the chain. Damage was most severe in Martinique where total damage was estimated at €400 million and three indirect deaths, while nearby Guadaloupe suffered €400 million of damage. In St. Lucia, damage was mostly caused by the high seas and was estimated at US$18 million. Martinique experienced 75 mph (120 km/h) winds with gusts to 105 mph (170 km/h). The torrential rainfall, which reached 332 mm (13.07 in) caused flooding throughout the island, with the town of Rivière-Pilote flooding completely. The majority of Martinique's population were left without electricity, water, telephone, or food, and 600 Martiniquans were left homeless. The storm destroyed Martinique's entire banana crop, and 70% of the island's sugar cane plantations. The damage to these two agricultural sectors accounted for the majority of the island's €400 million damage. On the evening of August 16, 12 hours before the storm arrived in St. Lucia, power outages began in some of the island's neighborhoods. The night saw heavy rains, 1.58 in (40 mm) at St. Lucia's Hewanorra International Airport, and intense thunderstorms and by morning hurricane force winds peaked at 90 mph (145 km/h). The winds uprooted trees, downed electricity poles, disabled bridges, triggered landslides, and damaged several roofs. Saint Lucia's capital, Castries, was flooded by the storm surge which left boulders and fishing boats on the streets. One person drowned in Sarrot after being swept away by a rain-swollen river while trying to recover a cow. Hurricane Dean damaged the roofs of two of the island's hospitals, but no one was injured. Several other buildings were damaged, mostly on the island's northern coast which was most exposed to the hurricane. The Ministry of Education reported that 11 schools had sustained a combined total of EC$300,000 of damage, and nationwide damage to housing and buildings totaled EC$800,000. The Ministry of Communications, Works, Transport, and Public Utilities reported that most of the country's major infrastructure remained functional, and no long-term disruptions occurred. The hardest hit area of Saint Lucia was its agricultural sector. 5,000 acres (20 km2) of banana farms in Mabouya Valley, Roseau Valley, and Marc Marc were severely damaged with many of the plantations waterlogged or outright destroyed. An average of 75% of the crops were lost, with fields in the Northern Farms losing up to 80% and in the Roseau Valley losing up to 85%. The cost to the agriculture industry was $13.2 million, bringing Hurricane Dean's total cost on the island to $17.3 million (US$6.4 million in 2007) or 0.5% of the nation's GDP. The storm passed to the south of most of the Greater Antilles, though its outer rain bands crossed many of the islands, and delivered hurricane force winds to Jamaica. Puerto Rico, Cuba, and the Cayman Islands were mostly spared, though Hurricane Dean passed 50 to 60 mi (80 to 95 km) south of Jamaica as a Category 4 hurricane. In Jamaica the rain caused flooding on the eastern side of the island and landslides on the northeast end. At least two direct deaths were confirmed. Over 1,500 roofs were lost, primarily to the hurricane force winds, and 1,582 of the 3,127 damaged homes were uninhabitable. Landslides and fallen trees blocked hundreds of roads, particularly in the rural northeast region. As in the Lesser Antilles, Jamaica suffered severe damage to its agricultural sector. Forty percent of the sugarcane crop, 80 to 100% of the banana crop, 75% of the coffee trees under three years old, and 20% of the top layer of the cocoa crop were lost. Hurricane Dean affected 248 roads, including 186 that were blocked: 10 were blocked in the Kingston metropolitan region, 14 sections were blocked in St. Andrew, 43 roads were blocked in St. Catherine, eight roads were blocked in the Western Region (Saint James, Hanover, Westmoreland, and Trelawny), and 110 roads were blocked in the Northeast region. Haiti and the Dominican Republic, which share the island of Hispaniola, were spared much of the hurricane's force, as it passed 170 mi (270 km) to their south. However, 15 people were killed among the island's two nations. Heavy rain flooded the streets of Santo Domingo and rough surf pounded the coast. Rain also caused landslides in Haiti, destroying several hundred homes and forcing 5,154 people into temporary shelters, and compromising the temperamental water system in the town of Bainet. Cuba, Puerto Rico, and the Cayman Islands experienced high surf and heavy rains, though despite a power outage in Grand Cayman, no significant damage was reported. There, 2000 people weathered the storm in temporary shelters. The hurricane's outer bands swept over Cuba between August 19 and August 21, bringing heavy rain and high seas, yet sparing the island from damaging winds. Rain from Hurricane Dean flooded several roads throughout Puerto Rico, and there was heavy surf along the island's coast, but no deaths or injuries were reported. 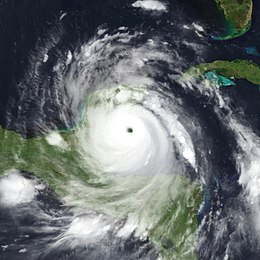 The hurricane strengthened right up until it made landfall near Majahual on the Quintana Roo coast of the Yucatán Peninsula on August 21, 2007 as a Category 5 hurricane. Wind gusts of 200 mph (320 km/h) were reported. The state's tourist cities of Cancún and Cozumel were spared the worst of the storm, but it wreaked havoc in the state capital Chetumal, 40 mi (65 km) south of landfall, causing significant flooding. The town of Majahual, which had a population of 200, was totally destroyed by the storm. Storm surge and high winds severely damaged or destroyed hundreds of buildings and had the strength to crumple steel girders. The waves tore away portions of the concrete docks at Costa Maya's popular cruise port and the harbor was closed to cruise ships for almost a year. Despite the storm's tremendous intensity, not a single death was attributed to its initial landfall, owing mostly to the government's thorough preparations and forecasters' ample warning. Following the second landfall on the Veracruz coast, two rivers in the mountains of the state of Hidalgo overflowed, and rain fell as far west as the Pacific coast. Veracruz Governor Fidel Herrera said there was "a tremendous amount of damage". Petroleum production was not severely damaged and quickly returned to normal. Rainfall amounts of 4 to 8 in (100 to 200 mm) fell across the states of Jalisco and Nayarit. This rainfall caused one fatality in Jalisco after a mudslide fell on 10 houses, killing one of the occupants. Five people were killed in Puebla by landslides, and one more was crushed after a wall on his house collapsed. One person in Veracruz was electrocuted after touching a power line while doing roof repairs. In Michoacán, a man was struck by lightning under a tree in the outer bands of the storm, and two people died in Hidalgo when the roof collapsed in their house. Hurricane Dean killed 12 people in Mexico but remarkably no one was killed by its first (and catastrophically powerful) landfall on the Yucatán Peninsula. Between the two landfalls damages, focused mainly in the agricultural sector, totaled Mex$2.05 billion (US$160 million). The town of Corozal on Belize's northern border experienced the worst conditions in the country. Trees were downed throughout the town, and minor flooding was reported. Eight thousand were displaced to shelters, though all returned home in less than two days. Throughout the entire country, the Belizean Ministry of Health reported no storm-related fatalities and only a few minor injuries. Belize's agricultural sector received significant damage. Its sugar cane fields and papaya crops suffered extensive damage. The Belizian Government's National Emergency Management Organization estimated Dean's damage to the papaya industry at BZ$30 million and to the sugar industry at 6,000 acres (24 km2) worth BZ$3.6 million. Belize Sugar Industries Ltd. reported that the country's sugar crop that year was the worst on record, producing 980,000 lb (445,000 kg) of sub-standard cane, compared to 1.2 million lb (545,000 kg) of high quality cane the year before. More than 1000 people were out of work as a result of the damage to the papaya and sugar cane plantations. The government attempted to improve the next crop season in 2008 by providing fertilizers to the farmers whose land had been damaged by Dean the year before. Prime Minister Said Musa estimated that it would cost US$10 million to replace or repair all the damaged houses in Belize. No land effects were reported in Nicaragua but a four-year-old girl drowned on a boat that sank amidst high winds and waves at the mouth of the Kukra River. While the hurricane itself never approached the United States, heavy surf and rip currents were reported on the beaches of Florida. One person drowned and at least 35 people had to be rescued from the turbulent waters at Siesta Key caused by Hurricane Dean. Rough seas produced by Dean caused minor flooding in Dauphin Island, Alabama. Damages from the flooding amounted to $100,000. The remnant circulation of Dean, after lingering off the Pacific Coast, moved inland by Santa Barbara, California, and brought heavy thunderstorms and localized flooding to coastal Southern California on the morning of August 26. The remnants crossed the Mojave Desert on the morning of August 27. Las Vegas, received a daily record of 0.58 in (15 mm) of rain, with flash flooding and minor damage. This Royal Caribbean ship, Freedom of the Seas, was the first cruise ship to visit Jamaica after Hurricane Dean. It called into Ocho Rios on August 22. Despite Dean's significant damage, it did not have severe effects on infrastructure, and the non-agricultural sectors of most affected nations recovered quickly. Most cruise lines diverted their ships away from the Western Caribbean in anticipation of Hurricane Dean's passage, though by August 27 all were back on schedule, except those with damaged ports in Belize and the Yucatán. The Lesser Antilles and the Greater Antilles were especially quick to resume servicing cruise lines, as their ports opened within days. Although Hurricane Dean was only a Category 2 hurricane when its northern eyewall passed over Martinique, the wind and widespread flooding destroyed 70% of the island's sugar cane crop and all of its banana crop, valued at €400 million  or 10% of GDP. Remarkably the tourism industry withstood the storm well; only a few hotels reported minor damage and the airport opened the day after the hurricane. Other than landscaping damage, all of the island's hotels were fully functional by the end of August. The French Overseas Minister, Christian Estrozy and French Prime Minister, Francois Fillon visited French Caribbean island to assess the storm's damage. They estimated the storm left 600 people homeless. The brevity of their visit prompted some of Martinique's famous writers, including Edouard Glissant, Patrick Chamoiseau and Raphael Confiant, to write an open letter airing their grievances concerning French politics and the handling of Hurricane Dean's impact. Francois Fillon then visited Guadaloupe and brought with him a team of experts from the Ministry of the Interior to assess the nature and cost of the damage. The local government reported to them that 75% of Guadeloupe's banana plantations, valued at €100 million, were totally destroyed. Despite promises by Overseas Minister Christian Estrosi that all problems would be resolved within three months, it took over six months to restart banana production, and several more to restore lost capacity. Other than the crop damage, the island suffered only minor wind and flooding damage, both of which were quickly repaired. On August 24 Jamaican Prime Minister Portia Simpson Miller announced that her government would provide JA$225 million (US$3.2 million) in emergency assistance to the country's agriculture sector. This aid was targeted at the country's hardest-hit parishes. She also announced a JA$500 million (US$7.1 million) programme to provide grants and low-interest loans for emergency housing repairs. Temporary tarpaulins were also provided to patch roofs at no cost. The World Food Program immediately placed 5,500 Jamaicans on complementary food assistance, a daily ration of 1900 kJ (450 kcal) of High Energy Biscuits, for two weeks. Within three days US$398,000 of pre-prepared United States Agency for International Development (USAID) emergency supplies arrived on the island. The airlift was composed mostly of mattresses, blankets, plastic sheeting, hygiene kits and water containers. The Inter-American Development Bank (IDB) provided a US$200,000 grant to support the relief effort and the Chinese Red Cross, despite dealing with Typhoon Sepat, sent US$30,000 to its Jamaican counterpart for the purchase of emergency relief supplies. In December, four months after the hurricane struck the island, the World Bank's board of directors approved a US$10 million emergency loan. World Bank Director for the Caribbean and the Jamaican Finance Minister negotiated a 17-year repayment plan, and endowed the money into the Jamaica Hurricane Dean Emergency Recovery Project. The Jamaica Social Investment Fund, which was charged with implementing the project, used the money to "rebuild and support schools, health centers, and community and farm roads affected by the hurricane". The Hurricane Dean Emergency Recovery Project finally kicked off in June 2008, with the issuance of rural road repair contracts valued at JA$37 million (US$520,000). By the end of the summer on 2008, banana production in Jamaica was returning to pre-Dean levels. With the help of JA$1.1 billion (US$15.5 million) of aid from the EU's Banana Support Programme, thousands of acres were replanted. Banana chips were the first products ready for export at the beginning of the summer, with fresh banana production following shortly thereafter. Costa Maya, Mexico. The pier and resort seen here were destroyed by Hurricane Dean but rebuilt the following year. Although Dean's landfall in Mexico occurred in a relatively uninhabited area and the storm's well-predicted track gave ample warning, the storm inflicted extreme damage. In Majahual, the only town to experience the full force of the hurricane, hundreds of buildings were destroyed. Quintana Roo Governor Félix González Canto reported that although the cleanup in the state capital of Chetumal was completed within three weeks, it took more than six months to fix all of the region's more rural roads. Unable to handle the hurricane's aftermath, the state government appealed to federal authorities for aid. Together, they established a housing-repair fund which contributed to the reconstruction of over 37,000 residences. The cruise port of Puerto Costa Maya was severely damaged, causing Carnival Cruise Lines and Royal Caribbean Cruises, the world's two largest cruise operators, to divert away from the port until at least 2009. The Mexican government was quick to fund rebuilding of the destroyed concrete piers which, by June 2008, were rebuilt to accommodate even larger ships than before. The federal government was initially lauded for its swift and thorough preparation to which most observers, including the United Nations, attributed Dean's low death toll. However, after the storm there were several accusations of political motivation in the distribution of aid. Members of President Felipe Calderón's Partido Accion Nacional (PAN) distributed bags of bread, funded by the nation's disaster relief coffers, carrying the party's logo. In Veracruz Governor Fidel Herrera was accused by both the PAN and his own Partido Revolucionario Institucional (PRI) of using state resources, including hurricane relief, to support the campaigns of PRI candidates. As the first Category 5 landfalling hurricane in 15 years, and due to its widespread impact, the name Dean was officially retired on May 13, 2008 by the World Meteorological Organization during its annual meeting in Orlando, Florida, and will not be used for a future Atlantic hurricane. It was replaced by Dorian on List V of the Atlantic hurricane naming lists, which was used in the 2013 Atlantic hurricane season. Hurricane Dean featured prominently in the travel novel Chasing Dean by Welsh surf/travel writer Tom Anderson. The book is an account of surfing America's hurricane states and the swell produced by Hurricane Dean. ^ Pasch/Brown (August 21, 2007). "Hurricane Dean Discussion Thirty Three". National Hurricane Center. Retrieved August 20, 2007. ^ Brown/Franklin (August 13, 2007). "Tropical Depression Four Discussion Three". National Hurricane Center. Retrieved August 14, 2007. ^ Avila (August 14, 2007). "Tropical Storm Dean Discussion Five". National Hurricane Center. Retrieved August 14, 2007. ^ Brown (August 14, 2007). "Tropical Storm Dean Discussion Seven". National Hurricane Center. Retrieved August 15, 2007. ^ Beven (August 15, 2007). "Tropical Storm Dean Discussion Eight". National Hurricane Center. Retrieved August 15, 2007. ^ Blake (August 15, 2007). "Tropical Storm Dean Discussion Ten". National Hurricane Center. Retrieved August 15, 2007. ^ Brown (August 15, 2007). "Tropical Storm Dean Discussion Eleven". National Hurricane Center. Retrieved August 16, 2007. ^ Beven (August 16, 2007). "Hurricane Dean Discussion Twelve". National Hurricane Center. Retrieved August 16, 2007. ^ Blake (August 16, 2007). "Hurricane Dean Discussion Thirteen". National Hurricane Center. Retrieved August 16, 2007. ^ Avila/Blake (August 16, 2007). "Hurricane Dean Discussion Fourteen". National Hurricane Center. Retrieved August 16, 2007. ^ Franklin (August 16, 2007). "Hurricane Dean Discussion Fifteen". National Hurricane Center. Retrieved August 17, 2007. ^ Beven (August 17, 2007). "Hurricane Dean Discussion Sixteen". National Hurricane Center. Retrieved August 16, 2007. ^ a b c d Avila (August 17, 2007). "Hurricane Dean Discussion Seventeen". National Hurricane Center. Retrieved August 17, 2007. ^ Avila/Mainelli (August 17, 2007). "Hurricane Dean Discussion Eighteen". National Hurricane Center. Retrieved August 17, 2007. ^ Avila (August 17, 2007). "Hurricane Dean Discussion Nineteen". National Hurricane Center. Retrieved August 17, 2007. ^ Knabb (August 17, 2007). "Hurricane Dean Intermediate Advisory Nineteen 'A'". National Hurricane Center. Retrieved August 17, 2007. ^ Knabb (August 17, 2007). "Hurricane Dean Discussion Twenty". National Hurricane Center. Retrieved August 17, 2007. ^ a b Avila (August 18, 2007). "Hurricane Dean Discussion Twenty Three". National Hurricane Center. Retrieved August 18, 2007. ^ Avila (August 18, 2007). "Hurricane Dean Discussion Twenty Two". National Hurricane Center. Retrieved August 18, 2007. ^ Pasch/Brown (August 19, 2007). "Hurricane Dean Discussion Twenty Five". National Hurricane Center. Retrieved August 19, 2007. ^ Franklin/Rhome (August 19, 2007). "Hurricane Dean Discussion Twenty Seven". National Hurricane Center. Retrieved August 20, 2007. ^ Blake (August 19, 2007). "Hurricane Dean Public Advisory Twenty Eight". National Hurricane Center. Retrieved August 20, 2007. ^ Knabb (August 19, 2007). "Hurricane Dean Discussion Twenty Eight". National Hurricane Center. Retrieved August 20, 2007. ^ Pasch/Brown (August 20, 2007). "Hurricane Dean Discussion Twenty Nine". National Hurricane Center. Retrieved August 20, 2007. ^ Franklin (August 20, 2007). "Hurricane Dean Discussion Thirty". National Hurricane Center. Retrieved August 20, 2007. ^ Knabb (August 20, 2007). "Hurricane Dean Update". National Hurricane Center. Retrieved August 20, 2007. ^ "Mudslide Fears After Dean Batters Mexico". Sky News. August 21, 2007. Archived from the original on July 19, 2012. Retrieved March 12, 2014. ^ Avila (August 22, 2007). "Hurricane Dean Discussion Forty". National Hurricane Center. Retrieved August 22, 2007. ^ Stuart Hinson (August 26, 2007). "NCDC Event Record Details 679276". National Climate Data Center. Archived from the original on May 20, 2011. Retrieved July 2, 2008. ^ Jackson (August 30, 2007). "Surface Weather Map at 7:00 am E.S.T." National Centers for Environmental Prediction, Hydrometeorological Prediction Center. Retrieved July 2, 2008. ^ a b c d e f g h i j k l m n o p Franklin, James L. (January 31, 2008). "Tropical Cyclone Report: Hurricane Dean" (PDF). NOAA. Retrieved July 24, 2008. ^ Beven (August 16, 2007). "Hurricane Dean Public Advisory Twelve". National Hurricane Center. Retrieved August 16, 2007. ^ Blake/Avila (August 16, 2007). "Hurricane Dean Public Advisory Fourteen". National Hurricane Center. Retrieved August 16, 2007. ^ a b Brown (August 15, 2007). "Tropical Storm Dean Public Advisory Eleven". National Hurricane Center. Retrieved August 15, 2007. ^ a b Pasch (August 16, 2007). "Hurricane Dean Tropical Cyclone Update". National Hurricane Center. Retrieved August 16, 2007. ^ a b Blake/Avila (August 16, 2007). "Hurricane Dean Public Advisory Thirteen". National Hurricane Center. Retrieved August 16, 2007. ^ Franklin/Brown (August 16, 2007). "Hurricane Dean Public Advisory Fifteen". National Hurricane Center. Retrieved August 16, 2007. ^ Beven (August 17, 2007). "Hurricane Dean Public Advisory Sixteen". National Hurricane Center. Retrieved August 17, 2007. ^ Franklin/Brown (August 16, 2007). "Hurricane Dean Public Advisory Fourteen A". National Hurricane Center. Retrieved August 16, 2007. ^ a b c Michael Melia (August 15, 2007). "Hurricane Dean strengthens as it takes aim at Caribbean islands". Associated Press. Retrieved March 12, 2014. ^ a b c "Hurricane hits eastern Caribbean". BBC News. August 17, 2007. Retrieved August 17, 2007. ^ a b PAHO/WHO Caribbean Program Coordination (August 23, 2007). "Hurricane Dean in the Caribbean and Mexico, August 2007". Pan American Health Organization. Retrieved March 13, 2014. ^ Michael Melia (August 17, 2007). "Hurricane Takes Aim at Caribbean Islands". Washington Post. Retrieved August 14, 2008. ^ a b CDERA (August 22, 2007). "Summary of Impact of Hurricane "Dean" on CDERA Participating States" (PDF). Caribbean Disaster Emergency Response Agency. Retrieved March 12, 2014. ^ United States Agency for International Development (USAID) (August 23, 2007). "USAID provides hurricane assistance to Dominica and St. Lucia". Relief Web. Retrieved March 12, 2014. ^ Avila (August 18, 2007). "Hurricane Dean Public Advisory Twenty Two". National Hurricane Center. Retrieved August 18, 2007. ^ Knabb (August 17, 2007). "Hurricane Dean Public Advisory Twenty". National Hurricane Center. Retrieved August 17, 2007. ^ Knabb (August 17, 2007). "Hurricane Dean Intermediate Advisory Nineteen A". National Hurricane Center. Retrieved August 17, 2007. ^ Avila/Mainelli (August 17, 2007). "Hurricane Dean Public Advisory Seventeen". National Hurricane Center. Retrieved August 17, 2007. ^ Avila (August 18, 2007). "Hurricane Dean Intermediate Advisory Twenty Two A". National Hurricane Center. Retrieved August 18, 2007. ^ a b c d e f "Monster hurricane bears down on Jamaica". Agence France-Presse. August 19, 2007. Retrieved August 19, 2007. ^ a b World Vision (August 18, 2007). "As hurricane looms over Caribbean, relief teams prepare: World Vision positioning relief supplies for immediate response when storm hits Hispaniola". Relief Web. Retrieved August 25, 2007. ^ a b c United Nations Office for the Coordination of Humanitarian Affairs (OCHA) (August 18, 2007). "Hurricane Dean OCHA Situation Report No. 2". Relief Web. Retrieved August 26, 2007. ^ a b Caribbean Disaster Emergency Response Agency (CDERA) (August 18, 2007). "Hurricane Dean Situation Report #3". Relief Web. Retrieved August 26, 2007. ^ a b c d e Jonathan Katz (August 18, 2007). "Hurricane Dean Gains Caribbean Strength". Associated Press. Archived from the original on October 1, 2011. Retrieved March 10, 2011. ^ a b Carlos Barria (August 18, 2007). "Hurricane Dean bears down on Jamaica". Reuters. Retrieved August 18, 2007. ^ Howard Campbell (August 20, 2007). "Hurricane Dean Pummels Jamaica". Washington Post. Retrieved August 14, 2008. ^ "Jamaicans start to feel hurricane". BBC News. August 19, 2007. Retrieved August 19, 2007. ^ a b c d "Jamaica alert as Dean threatens". BBC News. August 19, 2007. Retrieved September 19, 2008. ^ "Little Cayman evacuated". Caymanian Compass. August 18, 2007. Archived from the original on September 27, 2007. Retrieved August 19, 2007. ^ Government of Cayman Islands (August 18, 2007). "Cayman Islands: Mandatory evacuation". Relief Web. Retrieved August 25, 2007. ^ a b Laura Johnston (August 18, 2007). "Cayman Islands Update — Hurricane Dean". Cayman Islands Department of Tourism. Archived from the original on September 30, 2007. Retrieved August 19, 2007. ^ Government of Cayman Islands (August 18, 2007). "Cayman Islands: Shelters open tomorrow". Relief Web. Retrieved August 25, 2007. ^ Government of the United Kingdom (August 20, 2007). "Cayman Islands: UK Naval ships prepare to assist with hurricane relief effort". Relief Web. Retrieved August 25, 2007. ^ a b c d United Nations Office for the Coordination of Humanitarian Affairs (OCHA) (August 20, 2007). "Hurricane Dean OCHA Situation Report No. 4". Relief Web. Retrieved August 26, 2007. ^ a b c d e f "Gulf States Mop Up After Erin, Ramp Up for Hurricane Dean". Environmental News Service. August 17, 2007. Archived from the original on September 30, 2007. Retrieved August 17, 2007. ^ NHC (August 22, 2007). "5-Day Track Forecast Cone and Watch/Warning". National Oceanic and Atmospheric Administration. Retrieved August 20, 2008. ^ AFP (August 19, 2007). "Hurricane Dean turns deadly". France 24. Archived from the original on September 30, 2007. Retrieved August 19, 2007. ^ "Declara SEGOB emergencia en Quintana Roo" (in Spanish). Notimex. August 17, 2007. Archived from the original on January 2, 2013. Retrieved August 17, 2007. ^ a b c d e United Nations Office for the Coordination of Humanitarian Affairs (OCHA) (August 19, 2007). "Hurricane Dean OCHA Situation Report No. 3". Relief Web. Archived from the original on September 27, 2007. Retrieved August 25, 2007. ^ "Preparativos en Yucatán por el huracán Dean". Diario de Yucatán (in Spanish). August 17, 2007. Archived from the original on August 11, 2007. Retrieved August 18, 2007. ^ Franklin/Rhome (August 19, 2007). "Hurricane Dean Public Advisory Twenty Six". National Hurricane Center. Retrieved August 19, 2007. ^ "Hurricane Dean hits Mexico coast". BBC. August 21, 2007. Retrieved August 21, 2007. ^ a b c d "Hurricane Dean Weakens, Expected to Spare Texas". National Public Radio. August 21, 2007. Retrieved July 23, 2008. ^ James Janmohamed (August 18, 2007). "San Pedro prepares for evacuation". San Pedro Daily. Archived from the original on September 29, 2007. Retrieved August 18, 2007. ^ Polya Lesova (August 15, 2007). "Crude oil, natural gas rise sharply on storm worries". MarketWatch. Retrieved August 15, 2007. ^ Alejandro Bodipo-Memba (August 16, 2007). "When gas prices go up, blame Dean". Detroit Free Press. Retrieved August 15, 2007. ^ "Storm-Drenched Texas Prepare for Hurricane Dean". Associated Press. August 16, 2007. Archived from the original on November 6, 2007. Retrieved August 17, 2007. ^ a b c "Hurricane Dean Gains Power in Caribbean". Associated Press. August 17, 2007. ^ Minerals Management Service (August 18, 2007). "Hurricane Dean Statistics Update". United States Department of Interior. Retrieved August 18, 2007. ^ David Ovalle; Jacqueline Charles; Martin Merzer (August 20, 2007). "Dean's rain reaches Mexico; damage reported in Jamaica". Miami Herald. ^ Cathy Rose (August 19, 2007). "Autoridades decretan alerta roja en Islas de la Bahía". La Prensa (in Spanish). Retrieved August 20, 2007. ^ Associated Press (August 17, 2007). "Blanco declares state of emergency". WWLTV. Archived from the original on September 26, 2007. Retrieved August 18, 2007. ^ Governor Rick Perry (2007). "Gov. Perry Declares Hurricane Dean Imminent Threat to Texas". Office of the Governor. Archived from the original on June 15, 2013. Retrieved August 17, 2007. ^ Elizabeth White (2007). "Texas Soaked by Erin, Braces for Dean". Forbes. ^ Jacqueline Charles; Jim Wyss; Martin Merzer (August 18, 2007). "Storm warnings posted in Jamaica, Caymans". Miami Herald. Archived from the original on December 16, 2014. Retrieved August 18, 2007. ^ "Hurricane Dean Forces NASA To Scale Back Final Spacewalk". Associated Press. August 18, 2007. ^ Mission Control Center (August 18, 2007). "STS-118 MCC Status Report #20". NASA. Retrieved August 18, 2007. ^ R. Frutos (November 30, 2007). "Close of the 2007 Atlantic Basin Hurricane Season". Belize National Meteorological Service. Archived from the original on August 2, 2008. Retrieved March 24, 2008. ^ International Monetary Fund (February 8, 2008). "Dominica's recovery efforts boosted by US$3.3m in IMF emergency assistance". Archived from the original on May 26, 2008. Retrieved March 24, 2008. ^ a b c d Unattributed (2011). "EM-DAT: The OFDA/CRED International Disaster Database". Centre for Research on the Epidemiology of Disasters. Université Catholique de Louvain. Retrieved September 15, 2011. ^ a b Howard Campbell (August 19, 2007). "Hurricane Dean pummels Jamaica". Pantagraph. Archived from the original on December 8, 2012. Retrieved August 20, 2007. ^ a b National Climatic Data Center. Angel, William; Hinson, Stuart; Herndon, Rhonda (eds.). "August 2008" (PDF). Storm Data. United States National Oceanic and Atmospheric Administration's National Environmental Satellite, Data, and Information Service. 49 (8): 519–520. ISSN 0039-1972. OCLC 647897316. Retrieved November 28, 2012. ^ "Heavy losses for Martinique; Eastern Caribbean reopens after Dean". Caribbean360. August 20, 2007. Archived from the original on September 29, 2007. Retrieved August 22, 2007. ^ "Hurricane Dean intensifies". Agence France-Presse. August 18, 2007. Retrieved August 18, 2007. ^ Danik Ibraheem Zandwonis (August 23, 2007). "Guadeloupe and Martinique after Dean". Caribbean Net News. Retrieved August 23, 2007. ^ "Hurricane destroys Martinique, Guadeloupe bananas". Reuters. August 18, 2007. Archived from the original on January 9, 2012. Retrieved August 18, 2007. ^ Computer Generated (August 16, 2007). "History for Hewanorra, St. Lucia: Thursday, August 16, 2007". Weather Underground. Retrieved August 17, 2008. ^ "History for Hewanorra, St. Lucia: Friday, August 17, 2007". Weather Underground. August 17, 2007. Retrieved August 17, 2008. ^ a b Amselma Aimable (August 18, 2007). "Report from St Lucia". Caribbean Net News. Retrieved August 22, 2007. ^ BBC NEWS (August 17, 2007). "Caribbean storm gathers strength". BBC News. Retrieved August 17, 2007. ^ "Hurricane Dean upgraded to powerful Category 4". CTV.ca. August 17, 2007. Archived from the original on August 23, 2007. Retrieved August 17, 2007. ^ a b United Nations Office for the Coordination of Humanitarian Affairs (OCHA) (August 21, 2007). "Hurricane Dean OCHA Situation Report No. 5". Relief Web. Retrieved August 22, 2007. ^ a b c d CDERA (August 21, 2007). "CDERA Mounts Level Two Response to Hurricane Dean Impact Update August 21, 2007, 4 p.m. EDT" (PDF). CDERA.org. Archived from the original (PDF) on September 28, 2007. Retrieved August 22, 2007. ^ "Hurricane claims one life in St. Lucia and possibly two in Dominica". CBC. August 17, 2007. Archived from the original on September 20, 2008. Retrieved 2007-08-17. ^ CIA (August 16, 2007). "St. Lucia: Economy". Central Intelligence Agency. Retrieved August 22, 2007. ^ Food and Agriculture Organization of the United Nations (FAO) (August 22, 2007). "Thousands in need of humanitarian assistance after Hurricane Dean". Relief Web. Retrieved August 23, 2007. ^ a b c "Se aleja huracán "Dean" de Puerto Rico sin causar daños". Milenio (in Spanish). August 18, 2007. Archived from the original on July 20, 2011. Retrieved August 17, 2007. ^ Franklin/Rhome (August 19, 2007). "Hurricane Dean Public Advisory Twenty Seven". National Hurricane Center. Retrieved August 19, 2007. ^ "Hurricane batters Jamaica's south". BBC News. August 20, 2007. Retrieved August 20, 2007. ^ Government of Jamaica (August 20, 2007). "Jamaica OPDEM Situation Report No. 8". Relief Web. Retrieved August 26, 2007. ^ a b Government of Jamaica (August 24, 2007). "Jamaica: USAID hands over emergency relief supplies". Relief Web. Retrieved August 26, 2007. ^ a b United States Agency for International Development (USAID) (August 24, 2007). "Latin America and the Caribbean – Hurricane Season 2007 Fact Sheet #3 (FY 2007)". Relief Web. Retrieved August 26, 2007. ^ a b c Government of Jamaica (August 21, 2007). "Jamaica OPDEM Situation Report No. 9". Relief Web. Retrieved August 26, 2007. ^ a b c Government of Jamaica (August 22, 2007). "Jamaica: Post-Hurricane Dean clean-up activities continues". Relief Web. Retrieved August 26, 2007. ^ Avila (August 18, 2007). "Hurricane Dean Public Advisory Twenty Three". National Hurricane Center. Retrieved August 18, 2007. ^ "Dominican Republic feels effects of Hurricane Dean". Dominican Republic News. August 18, 2007. Archived from the original on January 2, 2014. Retrieved August 19, 2007. ^ a b United Nations Office for the Coordination of Humanitarian Affairs (August 24, 2007). "Situation Report 7 – Hurricane Dean — August 24, 2007" (PDF). United Nations Office for the Coordination of Humanitarian Affairs. Archived from the original (PDF) on February 17, 2008. Retrieved August 26, 2007. ^ United Nations Office for the Coordination of Humanitarian Affairs (OCHA) (August 21, 2007). "Hurricane Dean OCHA Situation Report No. 5". Relief Web. Retrieved August 25, 2007. ^ "Tourists in Caribbean jam airports to escape Hurricane Dean". The Hindu. Associated Press. August 19, 2007. Archived from the original on September 30, 2007. Retrieved August 19, 2007. ^ Chris Kraul (August 21, 2007). "Mighty hurricane advances on Mexico". Sydney Morning Herald. Retrieved September 19, 2008. ^ a b Pan American Health Organization (PAHO) (August 20, 2007). "Hurricane Dean in the Caribbean: Situation Report 20 Aug 2007". Relief Web. Retrieved August 25, 2007. ^ Mark Stevenson (August 21, 2007). "Category 5 Hurricane Dean slams Mexico". Yahoo!. AP. Archived from the original on August 21, 2007. Retrieved 2007-08-21. ^ a b Spud Hilton; John Flinn; Larry Habegger (August 26, 2007). "Travelers' Checks: Hurricane Dean knocks out Costa Maya cruise port". San Francisco Chronicle. Retrieved August 27, 2007. ^ a b c d e "Hurricane Dean: Don't Cancel Your Trip". Fodor's. August 29, 2007. Retrieved June 27, 2008. ^ a b United Nations (August 22, 2007). "UN Teams Assessing Aftermath Of Hurricane Dean". Scoop Independent News. Retrieved July 28, 2008. ^ a b Diego Cevallos (August 24, 2007). "Mexico: U.N. applauds nation for hurricane disaster prevention". Interpress Service. Archived from the original on June 11, 2014. Retrieved July 28, 2008. ^ Diana Dawson (August 23, 2007). "Hurricane Dean's wake: updates from Mexico & the Caribbean". Los Angeles Times. Retrieved August 27, 2007. ^ a b "Hurricane Dean rains pound Mexico". Reuters. August 23, 2007. Retrieved October 24, 2014. ^ Servicio Meteorológico Nacional Mexico (August 3, 2007). "Remanentes del Ciclón Tropical "Dean"". Comisión Nacional del Agua. Archived from the original on August 26, 2007. Retrieved 2007-08-25. ^ "Death toll reaches 11 from Hurricane Dean in Mexico". Earth Times. August 24, 2007. Archived from the original on December 20, 2012. Retrieved August 24, 2007. ^ Tomas Bravo (August 22, 2007). "Hurricane Dean slams Mexico's Gulf coast, kills two". Reuters. Archived from the original on September 20, 2008. Retrieved 2007-08-22. ^ "Mas de 2 mil millones de pesos los daños por dean en Quinta Roo" (in Spanish). Agrointernet. September 11, 2007. Archived from the original on October 5, 2011. Retrieved September 12, 2008. ^ a b Tech. Sgt. Sonny Cohrs (August 22, 2007). "U.S. Assessment Team Arrives in Belize Behind Hurricane Dean". American Forces Press Service, News Articles. Retrieved July 23, 2008. ^ a b c United Nations Office for the Coordination of Humanitarian Affairs (OCHA) (August 22, 2007). "Hurricane Dean OCHA Situation Report No. 6". ReliefWeb. Retrieved July 23, 2008. ^ Blake Hounshell (August 22, 2007). "Hurricane Dean's big winner: sugar?". Foreign Policy. Retrieved July 24, 2008. ^ a b "Hurricane Dean costs Belize $107 Million +". The San Pedro Sun. August 30, 2007. Archived from the original on October 21, 2007. Retrieved July 23, 2008. ^ Manuela Ayuso (July 8, 2008). "Worse sugar season reported by Belize sugar industry". LoveFM. Archived from the original on July 22, 2011. Retrieved July 24, 2008. ^ Sarasota Herald-Tribune (August 23, 2007). "Lifeguards Rescue More Than 35 Off Siesta Key". The Tampa Tribune. Retrieved August 25, 2007. ^ " SignOnSanDiego News Services (August 26, 2007). "Thunderstorms dump rain on North County". San Diego Union-Tribune. Archived from the original on October 21, 2012. Retrieved September 6, 2007. ^ " AccuWeather.com (August 28, 2007). "AccuWeather.com — Weather Blogs- Weather News". AccuWeather. Archived from the original on May 8, 2007. Retrieved September 6, 2007. ^ "Martinique GDP (purchasing power parity)". IndexMundi. November 1, 2006. Retrieved June 29, 2008. ^ Christel Coïta (August 21, 2007). "Martinique Tourism Industry Withstands Hurricane Dean". For Immediate Release. Archived from the original on March 13, 2014. Retrieved July 24, 2008. ^ Steve Bennett (September 20, 2007). "Hotels report minor cosmetic damage; airport re-opened Saturday, August 18". Martinique Promotion Bureau. Archived from the original on June 26, 2008. Retrieved July 24, 2008. ^ "Guadeloupe and Martinique after Dean". Caribbean Net News. Associated Press. August 23, 2007. Archived from the original on October 5, 2007. Retrieved June 29, 2008. ^ "French PM to visit hurricane-hit Caribbean islands". Caribbean Net News. Associated Press. August 21, 2007. Archived from the original on October 5, 2007. Retrieved June 29, 2008. ^ "Dean caused 500m euro damage in French Caribbean". Caribbean Net News. Associated Press. August 30, 2007. Archived from the original on October 5, 2007. Retrieved June 29, 2008. ^ "Hurricane destroys Guadeloupe, Martinique bananas". Caribbean Net News. Associated Press. August 18, 2007. Archived from the original on October 5, 2007. Retrieved June 29, 2008. ^ UN News Service (August 21, 2007). "UN teams assessing aftermath in Caribbean nations hit by Hurricane Dean". UN News Center. Retrieved June 29, 2008. ^ Government of Jamaica (August 24, 2007). "Jamaica: $225 million in emergency aid for agricultural sector". Relief Web. Retrieved August 26, 2007. ^ Government of Jamaica (August 24, 2007). "Jamaica: NHT establishes $500 million loan fund for emergency repairs". Relief Web. Retrieved August 26, 2007. ^ World Food Program (August 30, 2007). "Hurricane Dean aftermath: WFP assisting over 10,000 victims in Jamaica and Belize". Reuters. Retrieved June 29, 2008. ^ Inter-American Development Bank (IDB) (August 24, 2007). "IDB approves US$200,000 grant for relief efforts in Jamaica". Relief Web. Retrieved August 26, 2007. ^ Government of Jamaica (August 25, 2007). "Jamaica: Chinese Red Cross donates US$30,000 for hurricane relief". Relief Web. Retrieved August 26, 2007. ^ The World Bank Group (December 20, 2007). "World Bank approves US$10 million to restore basic community infrastructure in the aftermath of Hurricane Dean". Relief Web. Retrieved June 29, 2008. ^ The World Bank Group (January 8, 2008). "Jamaica receives US$10 million to restore basic community infrastructure in the aftermath of Hurricane Dean". Relief Web. Retrieved June 29, 2008. ^ The World Bank Group (January 8, 2008). "Jamaica Hurricane Dean ERL". The World Bank Group. Archived from the original on December 26, 2011. Retrieved June 29, 2008. ^ Office of the Prime Minister (June 26, 2008). "Jamaica Hurricane Dean Recovery Project to be Launched on Friday". Jamaica Information Service. Retrieved June 29, 2008. ^ Chris Patterson (June 25, 2008). "Banana Industry to be Fully Recovered by the End of Summer". Government of Jamaica, Ministry of Agriculture. Retrieved July 24, 2008. ^ Miguel Hidalgo (October 31, 2007). "México: El Presidente Calderón en la entrega de viviendas a damnificados por el Huracán Dean" (in Spanish). Relief Web. Archived from the original on November 19, 2007. Retrieved August 21, 2008. ^ AP (September 19, 2007). "Much Hurricane Dean damage at Mexico's Puerto Costa Maya". Los Angeles Times. Retrieved July 24, 2008. ^ Maite Velez-Couto (September 11, 2007). 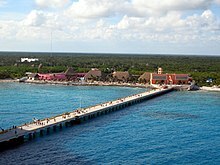 "Costa Maya begins rebuilding process". Valente Travel Inc. Retrieved January 7, 2011. ^ "Costa Maya Reopens with New Zip-Line Adventure". Caribbean News Digital. October 9, 2008. Retrieved September 19, 2008. ^ SourceMex (August 29, 2007). "Hurricane Dean causes minimal damage in Mexico despite storm's high intensity". Goliath Business Knowledge on Demand. Retrieved July 28, 2008. ^ NOAA (May 13, 2008). "Dean, Felix and Noel "Retired" from List of Storm Names". NOAA. Retrieved May 13, 2008. Wikimedia Commons has media related to Hurricane Dean.